In 2008, things began to change for pastor Ronald “Dee” Vaughan. Ministry had become burdensome, and that was a change for a man who loved local church ministry. He also began to feel a disconnection between the person he was felt forced to “create” for the church and the man he was on the inside. He began to withdraw at home, flashing unexplained irritability toward his family, being hyper-critical over insignificant things, and desiring to be alone. 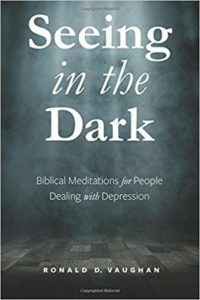 From his three-year experience, Dee has written a book of devotions titled Seeing in the Dark: Biblical Meditations for People Dealing with Depression. It’s available on Amazon.com and is written both for those walking through depression and for those who have a loved one in depression. Click HERE to see the book. The book, Dee says, began with a list he made while in the very dark days of his illness. “I called that list, ‘Wisdom,’” he says. “Anytime I read, heard, or thought of something that shone a bit of light on my illness and illuminated the next step toward healing; I wrote it down. The list includes Scripture passages that spoke to me at a time when the spiritual truth was very difficult to hear. The list also contains quotations that offered a helpful word. Many of the items on the list are discoveries I made working with doctors and counselors. Today, Dee has some insights about depression that he did not have before 2008 and his own journey through the darkness. He hopes these can be beneficial to pastors and to the congregations who love pastors. “A person’s life must consist of more than the work he or she does in serving a church,” Dee says. “I don’t mean more than what I do as a person living for Christ, but life must be bigger than the work. I’ve learned to be okay with unhappy, critical people so long as there’s not a legitimate complaint and a lesson to be learned. Pastors are approval-hungry, and we love to hear praise. The need for approval can make church members’ complaints crippling, and I’ve learned to shield myself from that in a healthy way. Dee says one of the blessings of his transparency has been the ministry doors that have opened to talk and encourage others. Dee Vaughan’s book, Seeing in the Dark, will likely help many people who read it, but in truth, his boldness to speak about depression has been shining a light into the darkness for quite some time.